We are receiving three email verifications - I only need one! We are receiving 3 different email verifications of the survey each time it is submitted. They all look the same. This is too much stuff cluttering the email. Is there a reason for the 3? Also, is there a way to have a copy automatically go back to the sender? 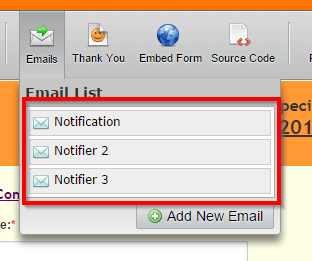 I see that there are 3 notifiers set on your JotForm and hence you are receiving 3 emails every time the form is submitted. You can delete two of them so that you would be receiving only one. Please refer to the guide below to delete email notifications from your JotForm.